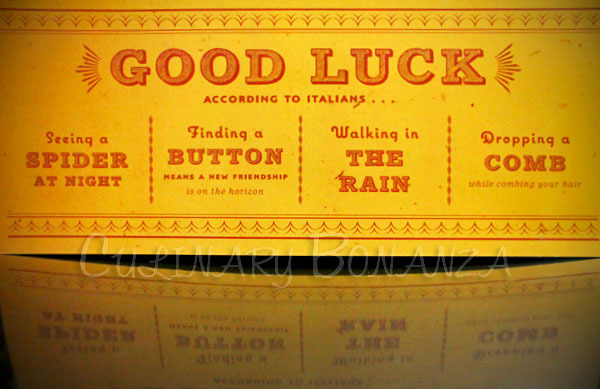 Bonanza (noun): a treasure trove, a discovery, a delicacy, a large amount of something good. If you follow American cooking shows, the name Mario Batali certainly sounds familiar. He is one of the Iron Chefs America with the quirky signature fashion: orange Crocs and bermudas. I won't say it's flattering (don't even get me started on this!) but somehow, it magically creates an endearing aura about him. That is, until he starts cooking...then, we're talking about some seriously ingenious passion here. 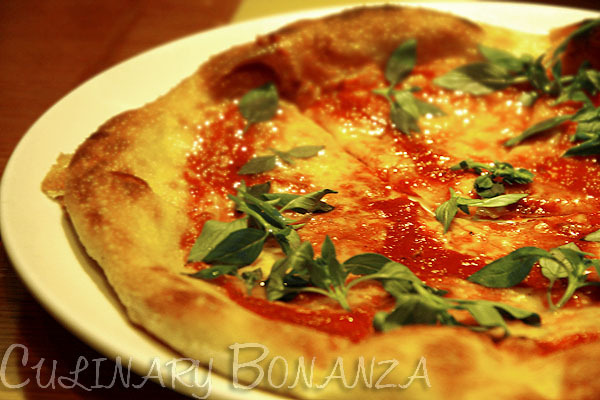 Pizzeria Mozza and Osteria Mozza hallmarked Mario Batali's first restaurants in the Asian continent (both are located adjacently at The Shoppes, Marina Bay Sands). Italian had been my premiere taste of fancy cuisine and it will always hold a special spot in my heart. I was excited to know that our lunch was going to be none other than Italian! Even more so, when I heard that the Italian restaurant is one of Mario Batali's establishments. 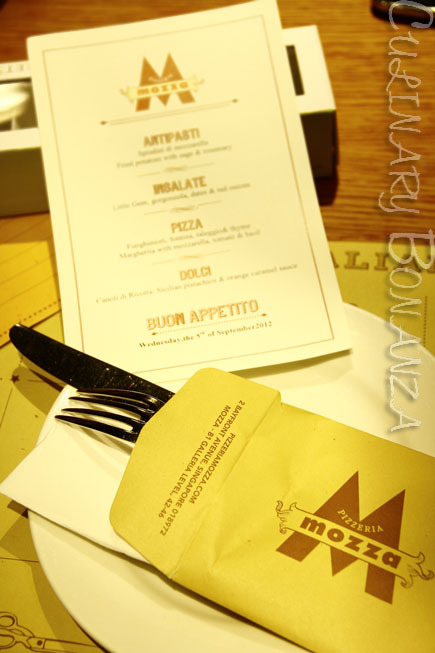 We were treated to a 4-course Italian lunch at Pizzeria Mozza that Executive Chef Carla Mendoza and team had kindly prepared for our group. 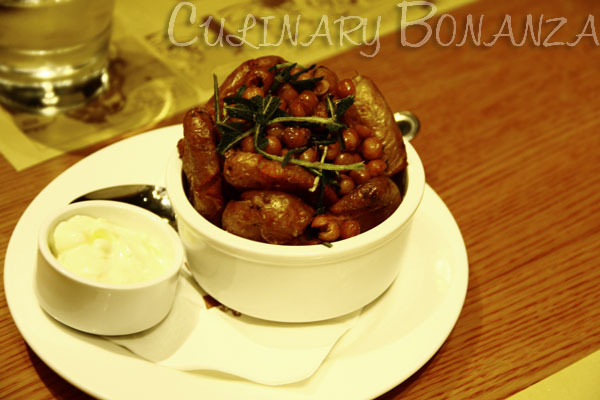 The fried potatoes with sage & rosemary delightfully began the meal with a high note. The whole fried potatoes are flat (flattened manually or genetically? 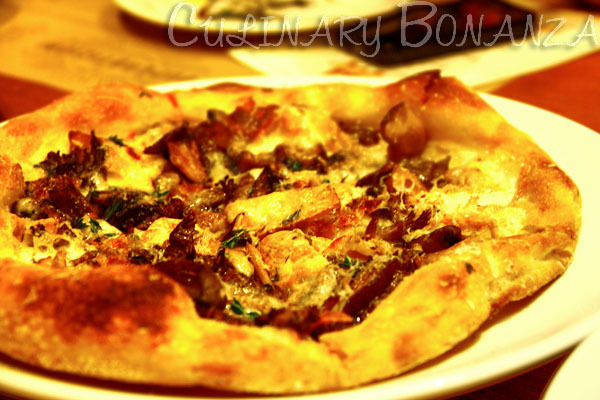 ), with the crispy skin neatly wrapping up the carbohydrate-rich and creamy bulb. Lettuce 'Little Gem' is supposedly a small compact variety of lettuce with a crisp, sweet heart. In this salad, the fresh green was bathed in generous gorgonzola cheese, topped with dates chunks and red onion slices. The sweet dates made a huge difference when eaten together with the savoury & odorous cheese and the crispy veggie. 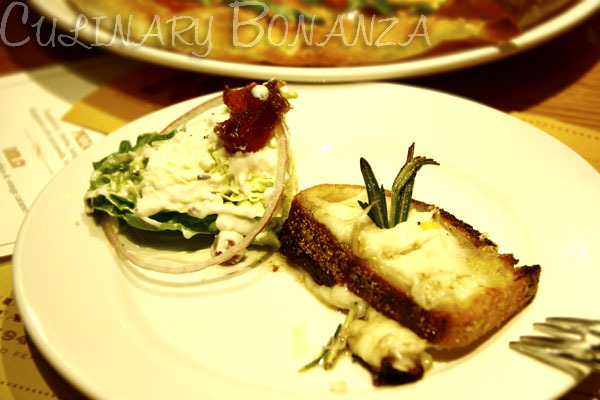 Spiedini di mozzarella is simply crispy bread stuffed with mozzarella cheese. I think some anchovies were added, as I detected some strong briny scent that I normally find in anchovies. Don't be deceived by the photos. These pizzas are actually large enough to share among 3-4 persons. I had expected thin-crusted crispy pizza, but what I saw was irregular and bulbous crust surrounding a messy load of toppings. The hollow crust is thin enough to break down like crackers upon biting. The mushroom pizza did not fare very well in the beauty department, but it was delicious...until I started to gulp in more water than normally necessary. Admittedly, the pizza had very generous toppings, but with that much sodium packed in each bites, I couldn't last more than 1 slice. Alas, the much anticipated sweet moment arrived. After the sodium-packed pizza, some sugary rush is definitely called for. We had the Cannoli di Ricotta. Some of us may be more familiar with the name cannelloni. They are both similar in base ingredients, shape and form, which is elongated and tube-like made of flour dough. 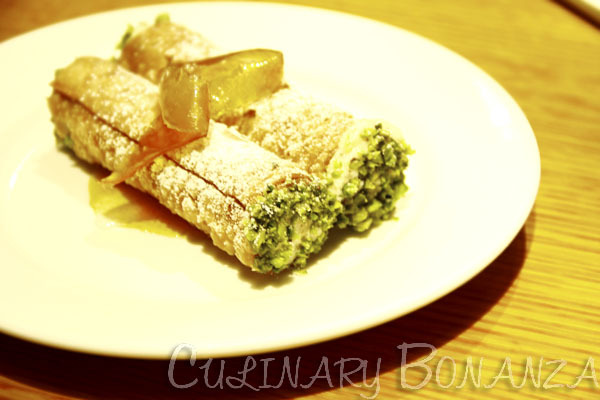 While cannelloni is served with savoury sauce as pasta, cannoli is actually a type of Sicilian pastry dessert. The Cannoli di Ricotta was stuffed with sweet creamy ricotta cheese, Sicilian pistachios and orange caramel sauce. Everyone in our group only managed to finish 1 tube. All, but me...Ha! Don't call yourself a sweet-tooth unless you can finish the 2 tubes! I liked it, albeit on the verge of sickening-sweet. I reckon it could use substantially less sugar, or add some orange juice for that zesty zing. Have a Naked (Foods) Breakfast! What Makes The Goods Diner Tick? experience of a big hot tummy! ..It's a journey after all..